Here you’ll find answers to all of your most commonly asked questions. How can solar PV water heating be more cost-effective than solar thermal? Isn’t solar thermal efficiency much better than solar PV? It is true that solar thermal collectors are currently more efficient per square meter (area) than solar PV modules in collecting solar energy. However, overall efficiency must also take into consideration factors such as heat loss in piping (especially in winter) and energy use of solar thermal circulation pumps. Solar thermal system lifetimes range from about 7 years (for cheap imports) to about 15 years for high quality (and more expensive) systems. (In a comprehensive analysis, Sandia National Laboratories found that about 50% of solar thermal systems fail within a 10-year period.) Solar PV modules are routinely guaranteed at 80% performance after 25 years, and the US National Renewable Energy Laboratory uses a lifetime of 33 years in its solar PV system calculations. Solar PV module costs have dropped dramatically – by over 80% in the past 5 years – and the trend is continuing. This has changed the paradigm. Whilst solar PV systems will continue to require more roof space than solar thermal in the short term, the key issue is not roof space, but cost. Solar PV systems have become cost-competitive to solar thermal, and the much longer lifetimes and lower maintenance translate into a lower lifetime cost per kWh. It is a set of energy efficiency regulations that are compulsory for new buildings and for additions and extensions to existing buildings. One of the key requirements of SANS 10400-XA is that no more than 50% of the annual volume of domestic hot water must be heated using grid electricity. The PowerOptimal ElonTM makes meeting this requirement easier than ever before, providing a new cost-effective alternative to heat pump and solar thermal systems. Do I need to change the heating element on my existing geyser to install a PowerOptimal Elon™ system? Not necessarily. PowerOptimal Elon™ works with existing standard AC heater elements, but the best element size (power rating) depends on the size of your solar PV array. If you are building a new house, you can just specify the right heater element from the start. Refer to the next question in this FAQ for a basic guide (full guide available on the Downloads page) or ask the PowerOptimal agent or your installer about the best solar PV module & heater element matching configuration for your needs. This depends on your geyser size / choice, number of people in the household, module power rating and hot water usage levels. Below is a basic guide. 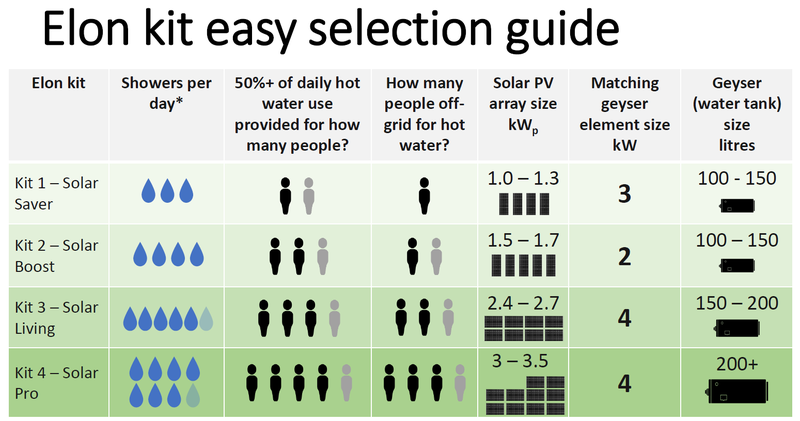 Refer to the PowerOptimal Elon™ 100 Solar PV Array and Heating Element Selection Guide on the Downloads page for a more detailed guide. What products are available in the PowerOptimal Elon™ range? There are two systems in the range: the Elon 100 and the Elon 400. The Elon 100 is focused solely on water heating using solar PV, whilst the Elon 400 is aimed at electrical utilities and includes additional functionality (such as internet connectivity, demand management of 4 electrical loads, remote solar metering and dispatchable demand response). What is the payback period for an Elon system? This depends on your current electricity tariff, how many solar modules you install, your hot water use, and electricity price increases in the next few years, but typically payback period is in the range of 4 to 6 years. With a typical solar module life expectancy of more than 30 years, this means that you will enjoy at least 25 years of free hot water! Where can I learn more about the PowerOptimal Elon™? Explore the website or contact the PowerOptimal team for more information and technical data sheets. How does PowerGuard® save you power and money? Most commercial customers pay peak demand charges, and thus a reduction in peak power demand directly leads to a reduction in your electricity bill. For devices such as air conditioners, PowerGuard® also helps reduce energy consumption, which leads to additional savings on your electricity bill. 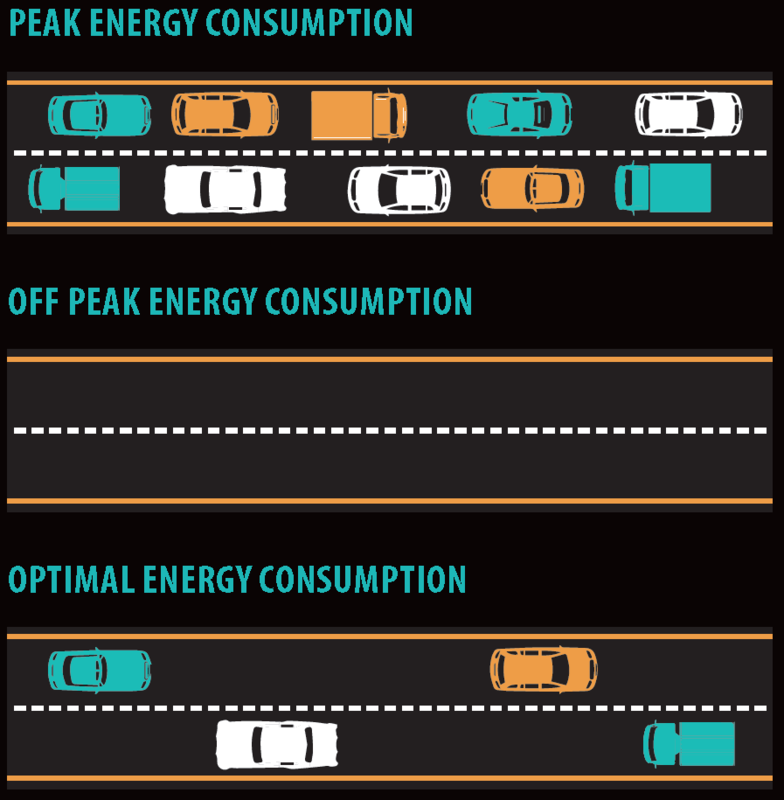 Peak demand is the maximum power demand that is required or used over a specified period of time. It is different to the amount of power consumed. Utilities and municipalities usually charge commercial consumers a peak demand charge, because their peak demand determines the amount of electricity that has to be generated at their power plants. For many commercial customers peak charges can be more than 50% of their electricity bill. 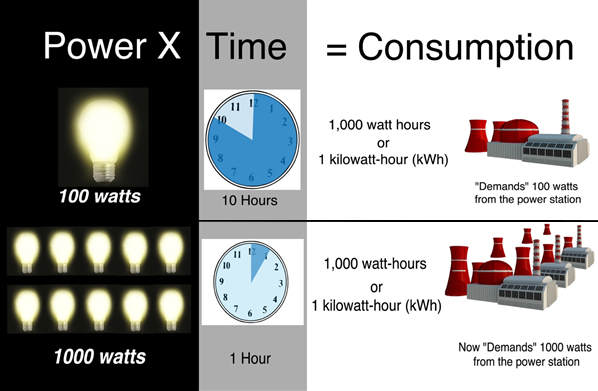 The picture to the right helps explain the difference between peak demand and amount of power consumed. As you can see, whilst the same total energy is used by 1 bulb in 10 hours or by 10 bulbs in 1 hour, the utility has to provide ten times more energy at any moment in time for the 10 bulbs than for the single bulb. This is what is called ‘peak demand’. For the single bulb, peak demand was 0.1 kW, and for the 10 bulbs it was 1 kW. So just by spreading out the load over time, the peak demand can be reduced dramatically, and thus reduce the number of new power stations that are required to be built. It can also help reduce the need for load shedding. Most commercial electricity customers in South Africa are charged for peak demand – i.e. the highest peak demand in any 10 or 30 min period in the month determines their peak charge. For many of them peak charges are more than 50% of their electricity bill. Can PowerGuard® be used with standby generators? PowerGuard® is an excellent companion for standby generator systems. It can automatically switch to a different load profile if grid power is lost, allowing you to operate at lower power supply levels. PowerGuard® can accommodate stand-by power generators as well as protecting loads against over and under voltage conditions. All units can operate with input voltages of between 180 to 420Vac indefinitely and can withstand 6,000 Volt spikes as well as conforming to regulated EMI standards. PowerGuard® has secondary settings allowing the consumer to use smaller standby generators than before. You can save on purchase price and fuel. For example, it might be possible to install a 6KvA generator instead of a 15KvA generator when combined with PowerGuard®. Will PowerGuard® reduce my company's carbon footprint? Demand management focuses mainly on reducing peak demand, and not on reducing power consumption. For an individual company, implementation of demand management in itself will not have a substantial impact on consumption, and thus the impact on the customer’s carbon footprint will be limited. The main benefit of demand management for an individual customer is in managing security of supply and reducing cost. However, where the loads that are managed consist mostly or solely of air conditioners, demand management does also lead to a reduction in consumption – up to about 15%. Thus there is a meaningful impact on carbon footprint in this instance. Also, there is a significant potential impact on carbon footprint from a national perspective. The utility has to have sufficient installed capacity to supply the highest peak demand, and any reduction in this peak leads to a reduced requirement for capital infrastructure and costly peaking plants that contribute to the national carbon footprint. Demand management needs to be seen as one part of a company’s approach to reducing its carbon emissions and potential carbon tax related liabilities. What is peak power demand and how does it affect my bill? There is only so much you can do to reduce your commercial electricity usage, but effectively managing your peak power demand can realise substantial further savings. HOW DOES POWER DEMAND DIFFER FROM USAGE? Think of it as a highway – at peak times, the traffic bottlenecks, leading to huge traffic jams. Yet at other times, the road is completely empty. Wouldn’t it be great if we could spread out highway-use so that traffic is always flowing but never congested, day and night? Unfortunately, the only way to make this happen, apart from re-building the highway, is if enough people decide to go work at midnight and at the early hours of the morning. Any volunteers? But, here’s the good news. With electricity, smoothing out this peak-time “traffic problem” is actually possible. This is called “Demand Management”. kWh is a unit of energy. It is equivalent to 1 kilowatt (kW) of power expended for 1 hour. A kVA is a 1000 volt amps. It is the apparent power used and is related to kW (real power) by the power factor. A low power factor means that the utility has to deliver more power than is actually required. Load factor is the average power divided by the peak power over a period of time, and is a measure of how constant the power use is. A low load factor means that power demand (the amount of power required at any point in time) varies a lot over time. A high load factor means that demand is relatively constant. Low load factors mean that utilities have to install more capacity (build more power plants) to cope with the high peak demands and variation in demand. This makes it more costly for them to supply power. In simplified terms, the power factor is the ratio between the kW and the kVA drawn by an electrical load where the kW is the actual load power and the kVA is the apparent load power that has to be provided by the utility. It is a measure of how efficiently the load current is being converted into useful work output.